Scorpio is very independent. They have a problem being alone. 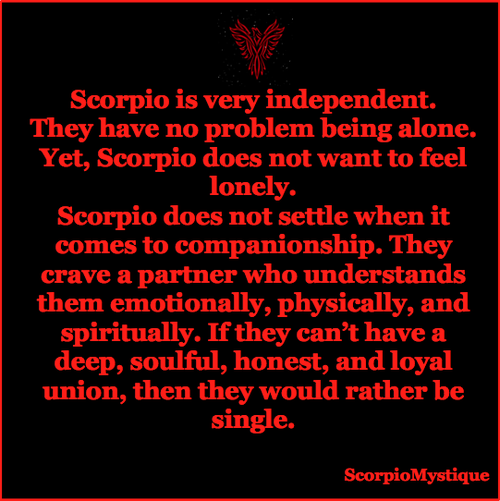 Yet, Scorpio does not want to feel lonely. Scorpio does not settle when it comes to companionship. They crave a partner who understands them emotionally, physically, and spiritually. If they can't have deep, soulful, honest and loyal union, then they would rather be single. 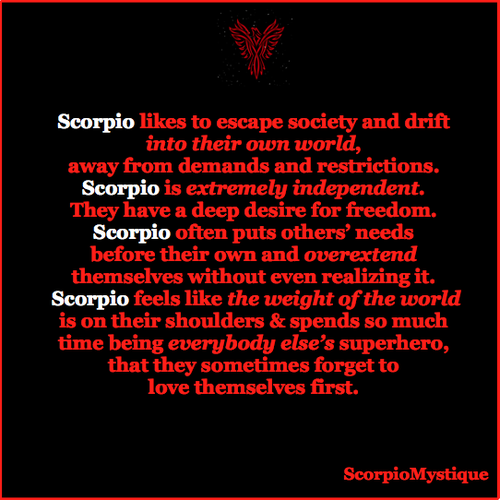 Independence is crucial to Scorpio's sanity. They are very stubborn and single-minded people who make their own rules and follow their own path. For this reason, Scorpio does not believe that anyone has power over them, be it a family member, teacher, government official or friend. You cannot force Scorpio to do anything. They follow no one's authority except for their own. Scorpio's self-confidence makes them a powerful leader with a deep capacity to rely on their own self, always. Some would say Scorpio was born suspicious. They tend to keep everyone at a safe distance, especially if they've never met you before. Scorpio's intuition tells them all that they need to know about you. We have a special ability of sensing when people are being dishonest. Scorpio does not fully trust anybody but themselves, but if you lie to them, you lose all chances of ever getting them to open up to you. 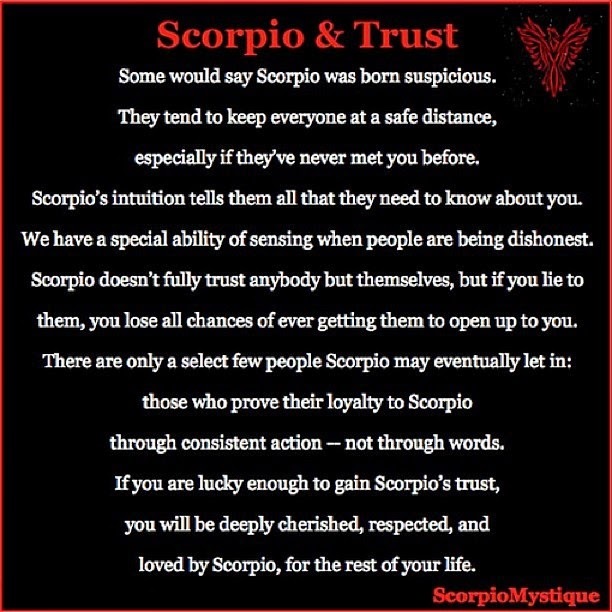 There are only a select few people Scorpio may eventually let in: those who prove their loyalty to Scorpio through consistent action- not through words. If you are lucky enough to gain Scorpio's trust, you will be deeply cherished, respected and love by Scorpio for the rest of your life. 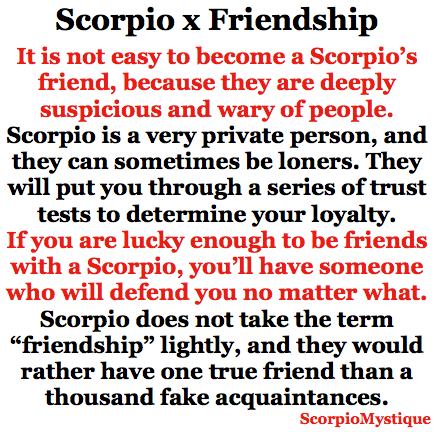 It is not easy to become a Scorpio's friend, because they are deeply suspicious and wary of people. Scorpio is a very private person, and they can sometimes be loners. They will put you through a series of trust tests to determine your loyalty. If you are lucky enough to be friends with a Scorpio, you'll have someone who will defend you no matter what. Scorpio does not take the term "friendship" lightly, and they would rather have one true friend than a thousand fake acquaintances. 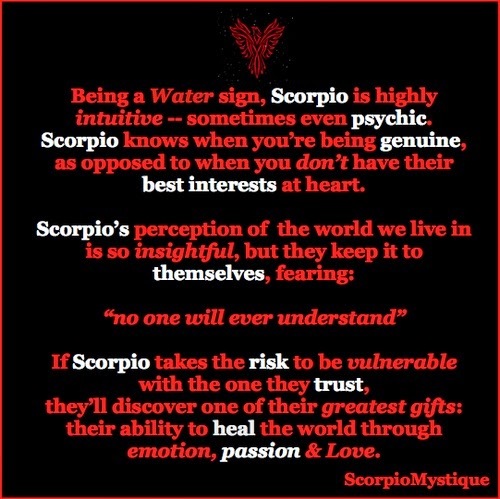 Being a Water sign, Scorpio is highly intuitive -- sometimes even psychic. Scorpio knows when you're being genuine, as opposed to when you don't have their best interest at heart. Scorpio's perception of the world we live in is so insightful, but they keep it to themselves, fearing: "no one will ever understand". If Scorpio takes the risk to be vulnerable with the one they trust, they'll discover one of their greatest gifts: their ability to heal the world through emotion, passion and love. Contrary to popular belief, Scorpio has a lot of patience and is not quick to anger. They'll quietly observe what you do for a long period of time first. However, there are limits to Scorpio's patience, and if you disrespect them or someone they love, you will see a side of them you've never seen before. 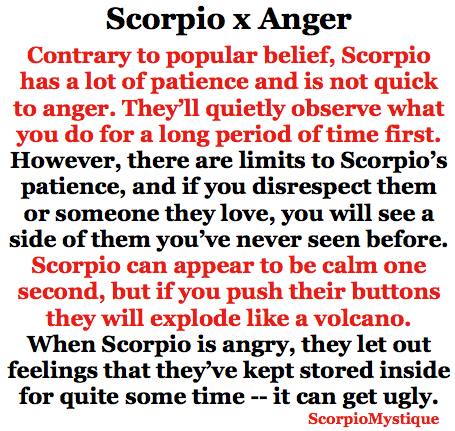 Scorpio can appear to be calm one second, but if you push their buttons, they will explode like a volcano. When Scorpio is angry, they let out feelings that they've kept stored inside for quite some time -- it can get ugly. 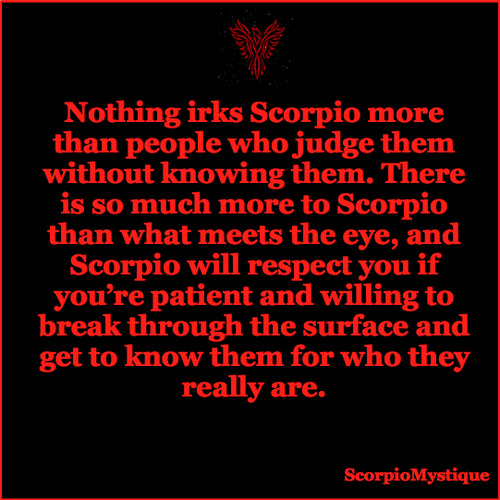 Nothing irks Scorpio more than people who judge them without knowing them. There is so much more to Scorpio than what meets the eye, and Scorpio will respect you if you're patient and willing to break through the surface and get to know them for who they really are. Some people consider Scorpio to be dramatic, but in reality, they are just very intense and profound people. Our emotions run deeper than most, and for this reason, we are able to dig up the truth, even if it makes other people feel uncomfortable. Scorpios believe in honesty,and they expect the same out of everyone in their lives --no exception. Scorpio is not a lukewarm person; for them, everything is all or nothing. 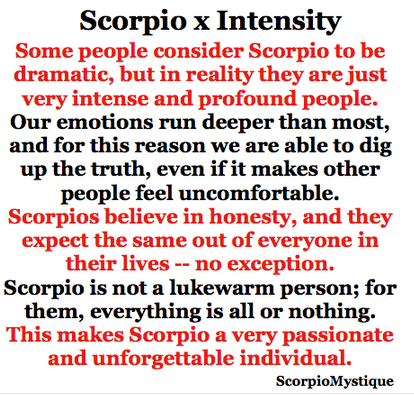 This makes Scorpio a very passionate and unforgettable individual. Scorpio likes to escape society and drift into their own world, away from demands and restrictions. 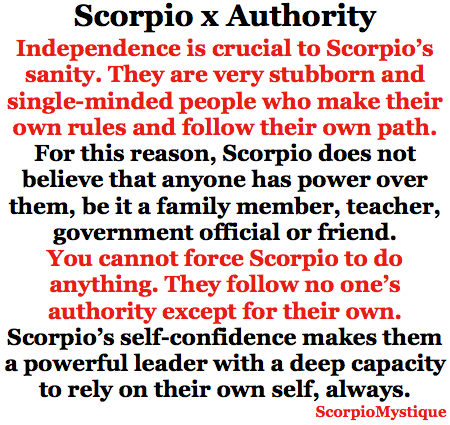 Scorpio is extremely independent. They have a deep desire for freedom. Scorpio often puts others' needs before their own and overextend themselves without even realizing it. Scorpio feels like the weight of the world is on their shoulders and spends so much time being everybody else's superhero, that they sometimes forget to love themselves first.